Unisex sports jersey (for men and women). Made with sublimation printed fabric. Collar with colour-customisable piping. Raglan short sleeves. Hemmed sleeve cuffs. Semi-snug fit. Colour-customisable. Suitable for any sport. Classical design with horizontal stripes. The Dundee jersey by Erreà at first might look like the traditional competition apparel for sports such as football, rugby, volleyball or the like. But don't be fooled! 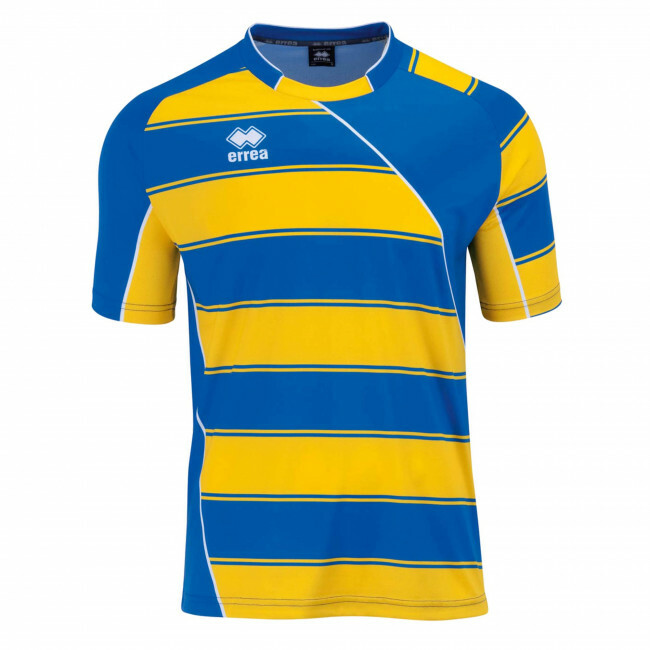 Designed for both men and women, with short sleeves, this jersey is colour-customisable (please, refer to our stores for customisations) so that you may match it with your team's colours. The short raglan sleeves, the hemmed sleeve cuffs and the breathable fabric provide a semi-snug fit and extreme comfort. This jersey is made of a stretch fabric woven with the precious Dupont yarns to assure the best garment stretchability. The horizontal stripes of the pattern and the inlaid on the front of the collar, convey a touch of elegance to the garment.